This book is written for the small business owner who wants to quickly get up to speed as it relates to generating merge letters to their numerous clients. Knowing how to produce merge letters, merge labels, envelopes using both MS Word and Excel is going to add an additional skill that will ultimately save you money by being able to do this yourself. Whether you are generating merge letters having to do with a business proposal or a Christmas or other holiday Greeting, you will certainly benefit from the knowledge that is imparted to you in this book. This book is meant for the everyday MS Word User that wishes to learn the solid basics as to creating Fillable Forms in MS Word. We thoroughly go over both the original Legacy package as well as the new Content Control package. When you are done with this book, you will be able to comfortably create Fillable Forms for your business as needed. 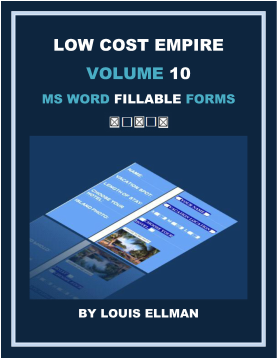 This is the second book of the Low Cost Empire Series having to do with using MS Word for small business owners (the first book being MS Word Merge for Small Business) and when you know this particular skill, you can save significant time and money by learning how to create your own forms as needed. Whether your business uses 1 form or 50 separate forms this book is for you! If you want to have major insight of what awaits you when you go to a hands on MS Word Legal Test at the employment agency then this is the book for you. You are getting an insider view of those subjects that will be covered on hands on tests and those topics that you must be fully comfortable with. You will also get much insight on those same topics. The good part is that even if you are not ready, you will know what to study and we can assist since we train people to work at top-tier legal firms on a regular basis and we have great supplemental materials. You can also call me for our full course offerings. ​This book which is Volume 1, is a compilation of articles that I have placed in blogs over the last 5 years as well as articles placed in my LinkedIn Groups. 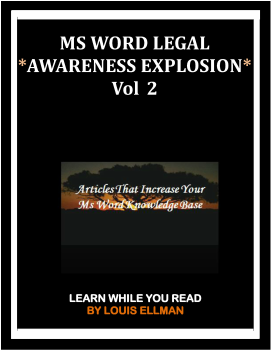 Volume 1 is a great start in expanding your existing knowledge base and awareness level as it relates to MS Word Legal. This is truly a niche market and there is not enough on point material being circulated for those wanting to break into the top-tier legal sector as well as those law firms that are medium size firms down to the single practitioner. We train basic-through advanced top-tier style legal word processing for secretaries and word processing operators. The information that we impart is useful to you right away rather than someday. This book represents an additional portion of the 5+ years of articles that I have contributed to various blogs. This series of books will give you an accurate window into what it is like to work in a top-tier legal word processing training center. Volumes 1 and 2 go over a tremendous amount of material. Each successive article is very different from the one before and each book covers a ton of ground. They are fun to read and the material is easy to understand and absorb. This is information that you can use right away rather than someday. You can think of this book as going to ”Legal Word Processing School” where you just have to read the easy flowing articles. It really makes no difference whether you have MS Word open in front of you or not. Either way, through our narrative style, you will be exposed to numerous scenarios, explanations, and solutions that will help you to grow as an operator or secretary. ​This Third book represents an additional portion of the 6 years of articles that I have contributed to various blogs. This series of books will give you an accurate window into what it is like to work in a top-tier legal word processing training center. Volumes 1 - 3 go over a tremendous amount of material! These 3 volumes represent over 150 separate scenarios and bonus material. Each successive article is very different from the one before and each book covers a ton of ground. They are fun to read and the material is easy to understand and absorb. This is information that you can use right away rather than someday. You can think of this book as going to ”Legal Word Processing School” where you just have to read the easy flowing articles. It really makes no difference whether you have MS Word open in front of you or not. Either way, through our narrative style, you will be exposed to numerous scenarios, explanations, and solutions that will help you to grow as an operator or secretary. The proper set up of your screen and settings before you start to style and /or edit your document. I have taught MS Word for Legal Fis for many years, placed numerous people in all facets of law firm personnel including secretaries, paralegals, word processing operators and IT Help Desk. In all the years I have been doing this, I have never had a student that went through this essential and vital routine that will be thoroughly revealed in this booklet. All of my students receive this from day 1. Once you know it you will surely never operate again without first doing this routine..
With this knowledge, you will have all vital settings taken care of and visually, you will have a ton of info at your fingertips. You can then comfortably move forward and style and/or edit your document. A good start is this booklet. It will be useful to you right away.